If you are looking for amazing versatility from an ale yeast look no further than Nottingham dry brewing yeast. Nottingham offers great performance with every batch allowing brewers to cover a wide variety of beer styles with just one yeast type. The Nottingham strain was selected for its highly flocculant & relatively full attenuation properties. It produces low concentrations of fruity and estery aromas and has been described as neutral for ale yeast allowing the full natural flavor of malt & hops to develop. The recommended fermentation temperature range of this strain is 14¡ to 21¡C (57¡ to 70¡F) with good tolerance to low fermentation temperatures (12¡C/54¡F) that allow this strain to be used in lager-style beer. 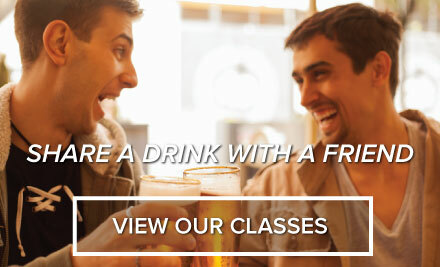 With a relatively high alcohol tolerance Nottingham is a great choice for creation of higher-alcohol specialty beers! Nottingham is available in 11 gram vacuum-sealed sachets. ¥ Quick start to fermentation which can be completed in 4 days above 17¡C. ¥ High attenuation reaching a final gravity near 1008 (2¡P). ¥ Fermentation rate fermentation time and degree of attenuation is dependent on inoculation density yeast handling fermentation temperature and the nutritional quality of the wort. ¥ Shows flocculation at completion of fermentation and settling is promoted by cooling and use of fining agents and isinglass. ¥ The aroma is slightly estery almost neutral and does not display malodours when properly handled. Because of flocculation it may tend to slightly reduce hop bitter levels. ¥ Best when used at traditional ale temperatures after rehydration in the recommended manner. 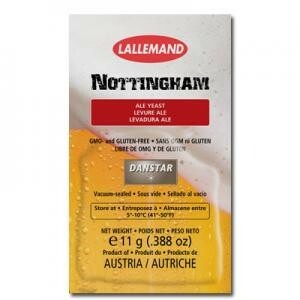 ¥ Lager-style beer has been brewed with Nottingham however low fermentation temperature requires adaptation of the pitching rate to ensure proper attenuation.